…it’s a crocheted map of the British Isles! Well, so far it’s only the south of England and a bit of Wales, but the rest is making steady progress. Hopefully it will eventually be stretched and framed or used as a wall hanging in one of our shops. The map is composed of 27 panels, each of which are 20 stitches wide and 80 stitches high. The final map will probably be about 6ft or 1.5m tall (in other words, big enough to stand in front of and read the weather). 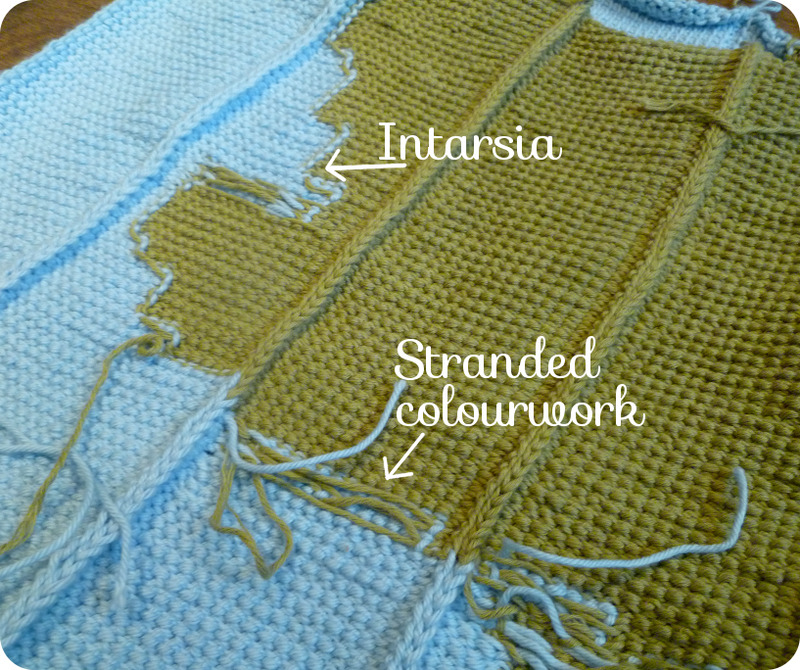 I’ve worked each panel in a mix of intarsia and stranded colourwork, depending on the placement of the colours in relation to one another. Rows with lots of green and lots of blue are worked stranded, while rows which are, say, blue at one side and green at the other are worked as intarsia. I’ve joined each panel with a method that was as close to mattress stitch as I could manage, which means that the overall picture is not disrupted by crazy seams. Another upshot of this is that there are also these cool ridges on the back that seem to be lending it some structural stability and keeping it from sagging when it is hanging up.